Euphorbia characias wulfenii has red stems and a profusion of chartreuse flowers. The flowers start blooming in the middle of winter and continue through to the middle of Fall. 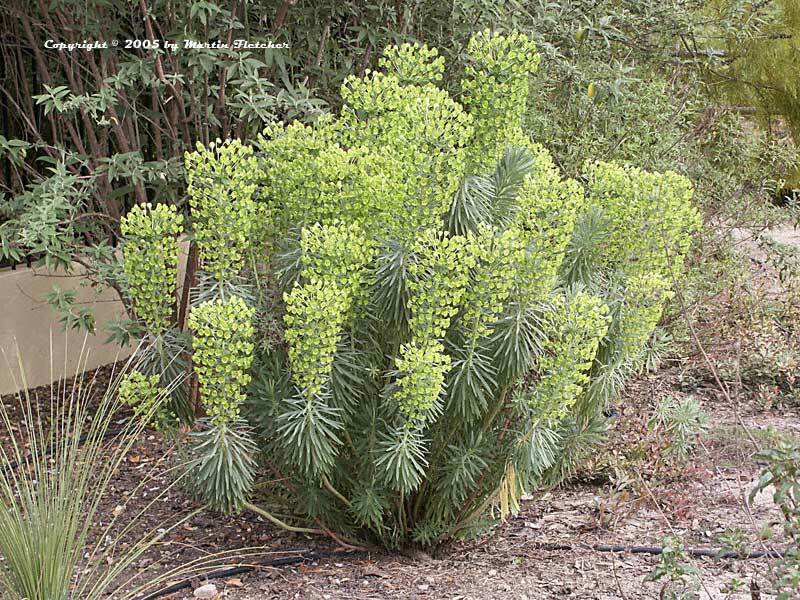 One of my clients calls Euphorbia characias wulfenii the Martian. With those lime green flowers Mediterranean Spurge does look it might have could have come from another planet. Euphorbia characias seedlings are common, sometimes too much so, Euphorbia characias wulfenii has become a weed in the Santa Barbara Riviera. This Euphorbia will rarely live beyond the second season, but due to the numerous aforementioned progeny this is rarely a problem. Care should be taken when working with the Mediterranean Spurge because the milky sap is toxic and can burn the skin. I use gloves or pick up the cut bits with my pruning shears. Lime green flowers and grey foliage of Euphorbia characias wulfenii - Mediterranean Spurge. High resolution photos are part of our garden image collection.